A user selects vehicles to compare by model year, make, and model. For each vehicle selected, the calculator retrieves the city and highway fuel economy from the database licensed from the fueleconomy.gov website with data sourced from Edmunds. For most vehicles, a range of prices is possible depending on what options the buyer selects. For these vehicles, we present the possible low and high prices, and use the low price as the default value. The user may override the default price to better reflect the particular model of choice. For some models, a single price is available. As each vehicle is selected, the fuel type and price is shown below the selected vehicles. The prices are based on a national average, as reported in the quarterly Alternative Fuel Price Report. The user may change the fuel price to reflect local prices. Normal Daily Use This section captures information about the driver's daily, repeating usage pattern, for example, commuting to and from work or school or running errands. The user enters average daily driving distance, how many days per week and weeks per year the vehicle is used in this manner, and how much of this driving is done in city vs. highway conditions. For plug-in hybrid vehicles, the user can select how often the vehicle will be recharged in the Electricity Use box. The tool will determine how much of the driving distance can be done using electricity, given the frequency of charging, assuming that the vehicle will be fully charged each time it is plugged in. Any distance in excess of this amount will be assumed to be powered by gasoline. Other Trips This section captures information about typical weekend driving and longer trips. The supplied value for distance is again taken from U.S. averages. The user may modify the distance and the percentage of city vs. highway driving. For plug-in hybrid vehicles, the tool assumes that the vehicle will travel the city portion of this distance using electricity, and the highway portion of this distance using gasoline. E85 Ethanol Use This section captures the percentage of time a driver plans to use E85 in the selected flexible fuel vehicle. Electricity Use If the user has selected a vehicle capable of recharging from the electric grid -- namely, a plug-in hybrid electric vehicle or an all-electric vehicle -- the user may supply the state where the vehicle is most often charged to determine the fuel mix (coal, natural gas, oil, etc.) used to generate the electricity in the user's area. This is needed to determine the greenhouse gases (GHG) emitted when generating the electricity in that area because each fuel in the mix has its own GHG emissions factor. If a plug-in hybrid is chosen, the user can select how often they plan to charge the vehicle. Biodiesel Fuel Use This section captures the percent of time a user plans to use biodiesel (B20 or B100) in the selected diesel-fueled vehicles. This section describes how the results are calculated, the assumptions made, and what underlying data are used. A plug-in hybrid electric vehicle (PHEV), which costs $32,500 and gets 42 mpg city and 38 mpg highway when operating on gasoline and uses 360 Watt-hours per mile (Wh/mi) when operating on electricity in the city and on the highway. He plans to charge it daily. A flex fuel vehicle (FFV), which costs $28,500 and gets a gasoline city/highway fuel economy of 20/28 mpg and 14/20 mpg when operating on E85. He normally drives about 34 miles per day for 5 days per week and does this for 49 weeks per year. Twenty-five percent of this driving is done under highway conditions and the rest is city driving. His other trips, taken over the weekends and on his three vacation weeks, amount to 4,000 miles with 50% of that done on the highway. Table 1 displays the selected vehicles' performance data being used for this example. And Table 2 summarizes the annual mileage data associated with the driving pattern that would be entered by the user. Fuel consumption is broken down into city driving and highway driving associated with normal daily vehicle use and with other trips. For gasoline vehicles like the HEV, this split is all that is required. The HEV calculations are summarized in the following equations, and the results are shown in Table 3. These equations are used to calculate fuel consumption for all vehicles that are not run with electricity from the electrical grid. See tables 1 and 2 to decode the abbreviations used to name the parameters. For the PHEV calculations, each driving type is further broken down into miles on electricity and miles on gasoline. The user may select one of three recharging schedules for normal daily use driving — twice per day, once per day, or every other day. When fully charged, the PHEV is capable of operating on grid-derived electricity for a limited number of miles (referred to as the all-electric range or AER). The potential average daily miles driven on electricity is set at AER times the number of recharges per day (RPD) specified by the user — 2, 1, and 0.5 for recharging twice per day, once per day, and every other day, respectively. If the normal daily driving mileage is greater than the potential daily miles on electricity (as defined by RPD times AER), the PHEV uses electrical power until the batteries are depleted, and gasoline is used for the remainder of the daily miles. The city-highway mileage split is assumed to be the same for the miles on electricity and the miles on gasoline. If the value of RPD times AER exceeds the normal daily mileage, only electric power is required for normal daily driving. For mileage in the "Other Trips" category, the PHEV is assumed to use electricity for the city portion of the driving and gasoline for the highway portion. The equations for the PHEV calculations are shown below. The FFV calculations are similar to the HEV calculations, except that the driver can choose between using E85 and gasoline, so fuel use for each fuel must be tracked. To facilitate this tracking, the user must input into the tool the fraction of the time he expects to refuel with E85. In this example, the driver expects to fill up with E85 half of the time. This assumes that the driver refills with the same volume of E85 as he does when he buys gasoline. The following equations calculate the city-highway breakdowns of E85 and gasoline use for this example. HMPG = highway mile per gallon for gasoline (gas) and E85 (e85). Table 5 summarizes the fuel and electricity use results for the three vehicles in this example. Having calculated the usage for each fuel, we can now determine the annual fuel cost and greenhouse gas emissions (GHG) for each vehicle. Table 6 summarizes the results of the cost and emissions calculations for the three vehicles. In addition to annual fuel and electricity costs, the calculator includes average costs for maintenance, tires, insurance, license, and registration. These costs were taken from a study done by the American Automobile Association (AAA), and represent average costs across the five vehicle classes studied — small sedan, medium sedan, large sedan, 4WD SUV, and minivan. Because of uncertainties in expected life and future costs associated with high-performance batteries, the cost to replace the battery pack has not been included in this tool. As of April 2011, the only commercially available advanced electric vehicles were the Nissan Leaf EV and the Chevrolet Volt PHEV and both have manufacturer warranties of 8 years or 100,000 miles. Table 7 presents a summary of the annual costs for the three vehicles in this example. To compare the costs for each selected vehicle, we need to calculate the sum of the purchase costs and the net present value of the annual costs over the life of the vehicle. To do this, we selected annual escalation rates for fuel and electricity and a discount factor to convert future costs into present costs. For calculating the cost of the vehicle, we assumed the buyer financed 90% of the vehicle price and took out a five-year loan at 6% interest (AAA 2010 pamphlet). This results in an annual payment of 0.232 times the net price of the vehicle for each of the first five years of vehicle ownership. Year one must also include the 10% down payment. Table 8 presents these costs for the three vehicles in this example. The following annual costs elements comprise the TAC: escalated cost of gasoline + escalated cost of E85 + escalated cost of electricity + maintenance/tire cost + insurance/license/registration cost + vehicle down payment (year 1 only) + annual vehicle loan payment (years 1 through 5 only). The escalation factors and discount factor used in these calculations and in the tool are listed in Table 9. 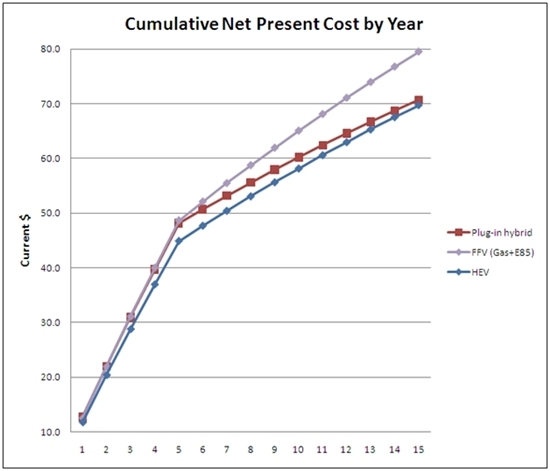 Once we calculate the net present value for each year's vehicle cost, we can calculate and graph the cumulative NPV for each vehicle for each year. The cumulative NPV for any year is the sum of the annual NPVs up to and including that year. This allows us to compare the cost of owning each vehicle as the cost accumulates over its life. Figure 1 presents the cumulative NPVs for the 3 vehicles in this example. For normal weekday driving, the user selects the frequency of PHEV re-charging — twice per day, once per day, or every other day. The chosen normal weekday re-charging frequency does not impact mileage on "Other" trips (described in item 3 below). For PHEVs during normal weekday driving, battery electricity is used until the battery is depleted and then gasoline is used; for both electricity and gasoline, the city-highway mileage split is assumed to be the same for the miles on electricity and the miles on gasoline. For E85 FFVs, the user inputs the percentage of the time he refills with E85. The tool assumes that this equates to the percentage of the fuel volume that is E85. This in turn assumes that the driver refills with the same volume of E85 as he does when he buys gasoline. Because of uncertainties in expected life and future costs associated with high-performance batteries, the cost to replace the battery pack has not been included in this tool. As of April 2011, the only commercially available advanced electric vehicles were the Nissan Leaf EV and the Chevrolet Volt PHEV and both have manufacturer warranties of 8 years or 100,000 miles. The cost of purchasing and installing a charging system has not been included in this tool. It is assumed that suitable outlets are available for the selected frequency of recharging. Cost estimates vary considerably depending on a number of parameters - level of electrical service chosen, availability of government and other incentives, a variety of possible battery charging business arrangements involving the car dealer or third parties, the house's or business' current electrical service, etc. This analysis does not include the vehicle trade-in value. If included, this could help the more expensive electric vehicles defray some of their excess upfront costs, depending on how they maintain their value relative to conventional vehicles. Table 9 presents the data and their sources used in the calculations. The following data sources and values were used in the calculations (Table 9). Vehicle Prices From fueleconomy.gov. Users may also substitute their own prices. Gasoline Escalation Rate 1.8% per year Annual Energy Outlook 2011, Table A3, Transportation section. E85 Escalation Rate 1.6% per year Annual Energy Outlook 2011, Table A3, Transportation section. CNG Escalation Rate 0.3% per year Annual Energy Outlook 2011, Table A3, Transportation section. LPG Escalation Rate 1.3% per year Annual Energy Outlook 2011, Table A3, Transportation section. Diesel Escalation Rate 1.8% per year Annual Energy Outlook 2011, Table A3, Transportation section. B20 Escalation Rate 1.8% per year Assumed the same as diesel. B100 Escalation Rate 1.8% per year Assumed the same as diesel. Electricity Prices Electricity prices from http://www.ventyx.com. Electricity Escalation Rate -0.3% per year Annual Energy Outlook 2011, Table A3, Transportation section. Discount Factor 2.3% Assumed value based on the current national average return on a 5-year CD (http://www.bankrate.com/cd.aspx). Normal Weekday Miles 34 Based on 2001 National Highway Transportation Survey: Summary of Travel Trends; Table 29. Prepared for the U.S. Dept. of Transportation Federal Highway Administration. December 2004. Normal Highway % Highway 45% Based on city-highway split for the Environmental Protection Agency's Federal Test Procedure. Annual Other Travel Miles 3,596 Based on 2001 National Highway Transportation Survey: Summary of Travel Trends; Table 29. Prepared for the U.S. Dept. of Transportation Federal Highway Administration. December 2004.